DISCLAIMER - All information provided here is for displaying seafloor properties and cannot be used for navigation purposes. 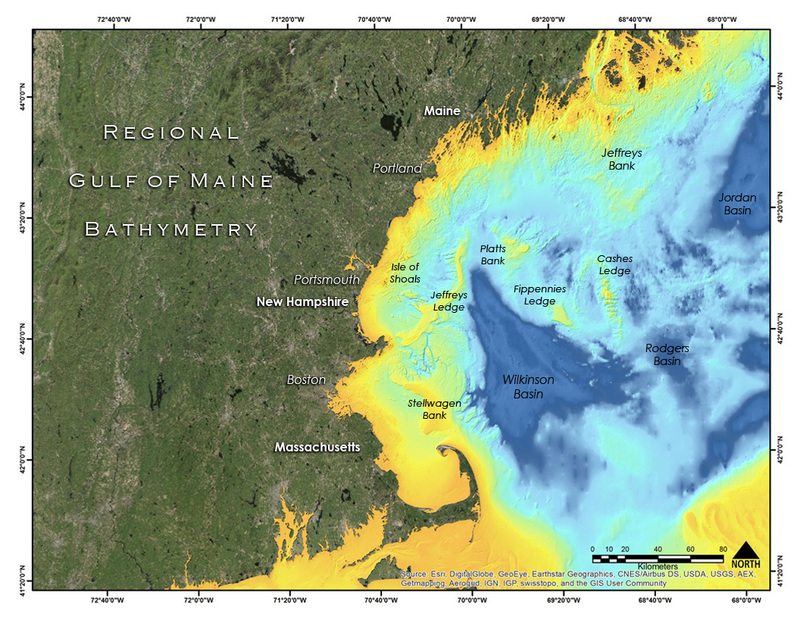 The Western Gulf of Maine (WGOM) seafloor is extremely variable with numerous bathymetric highs (e.g., Jeffreys Ledge, Caches Ledge), deep basins (e.g., Jeffreys Basin, Wilkinson Basin), extensive bedrock outcrops, and numerous sand and gravel bodies. As a result. the bathymetry varies dramatically over short distances. Fortunately, a number of high resolution multibeam echosounder (MBES) surveys have been conducted by several agencies and institutions, including the National Ocean and Atmospheric Administration (NOAA) National Ocean Survey (NOS), the United States Geological Survey (USGS), the University of New Hampshire (UNH) Joint Hydrographic Center/Center for Coastal and Ocean Mapping (JHC/CCOM), the Gulf of Maine Marine Institute (GOMMI), the United States Army Corps of Engineers (USACE), Maine Coastal Mapping Initiative, and private organizations (e.g., Science Applications International Corporation, Inc., SAIC). In order to develop a synthesis of the high resolution MBES, all available surveys known to JHC/CCOM that are relevant to the WGOM were obtained to develop a composite which is displayed in a Geographic Information System environment (ERSI ArcGIS). In addition, sweep-single beam data is included for a small area inside Portsmouth Harbor. The original surveys used in this compilation were gridded over a large range, varying from 50 cm to 25 m. To produce more uniform composites, a synthesis of the all the multibeam was re-gridded to 4 m. A second composite that includes older surveys that are of a much lower resolution (e.g., single beam echosounder survey gridded at 40 m) was re-gridded at 8 m. The original gridding, survey source, and other relevant information are included in the metadata for each survey which can be accessed directly from the composites by moving the curser over the survey area. The map below features the location of the MBES surveys and extent of the synthesis boundaries. The high resolution survey is displayed in Figure 1 and can be accessed at http://ccom.unh.edu/gis/maps/wgom/. Figure 1. High-resolution multibeam surveys gridded at 4 m for the Western Gulf of Maine Bathymetry Synthesis. The MBES bathymetry, combined with the lower resolution, regional bathymetry is shown in Figure 2 and can be accessed at http://ccom.unh.edu/gis/maps/WGOM_8m/. Figure 2. Regional multibeam bathymetry gridded at 8 m resolution. The high resolution (4 m) multibeam bathymetry data and the lower resolution (8 meter) regional bathymetry data can also now be accessed through a three dimensional GIS browser interface, see Figure 3, located at https://maps.ccom.unh.edu/portal/apps/3DViz/index.html?appid=7a1c657da7c04eea8317329e50fac2b2. Figure 3. The new GIS browser interface designed to allow users to interact with the high resolution multibeam bathymetry and the lower resolution regional bathymetry. Many of the MBES surveys used to create the MBES synthesis collected backscatter routinely with the bathymetry. Backscatter is the strength of the acoustic signal that returns to the transponder and is strongly affected by complex interactions with the seafloor properties, such as seafloor sediment texture, roughness, or biota. Although MBES backscatter can be problematic due to calibration issues and differences in instrumentation used in surveys (e.g., frequency), it often provides valuable information concerning the seafloor. In order to develop a composite of MBES backscatter in the WGOM, a subset of available surveys was assembled that were available from NOS and UNH JHC/CCOM. No attempt was made to include all of the surveys in the region due to the difficulty of combining varying surveys; instead, a subset for a region off of New Hampshire was chosen. The MBES backscatter synthesis shown in Figure 4 was processed using QPS Fledermaus FMGT, then mosaicked in ArcGIS. Due to the varying frequencies, different systems, and dynamic range of relative backscatter intensity values from combining multiple backscatter surveys, the range of pixel intensity values were normalized and standardized to create a seamless backscatter mosaic image. The primary purpose of the mosaic presented here is for viewing textural and geomorphological significant seafloor features detected with MBES backscatter. The backscatter layer gridded at 1.5 m is located at http://ccom.unh.edu/gis/maps/WGOM_BS/. Figure 4. 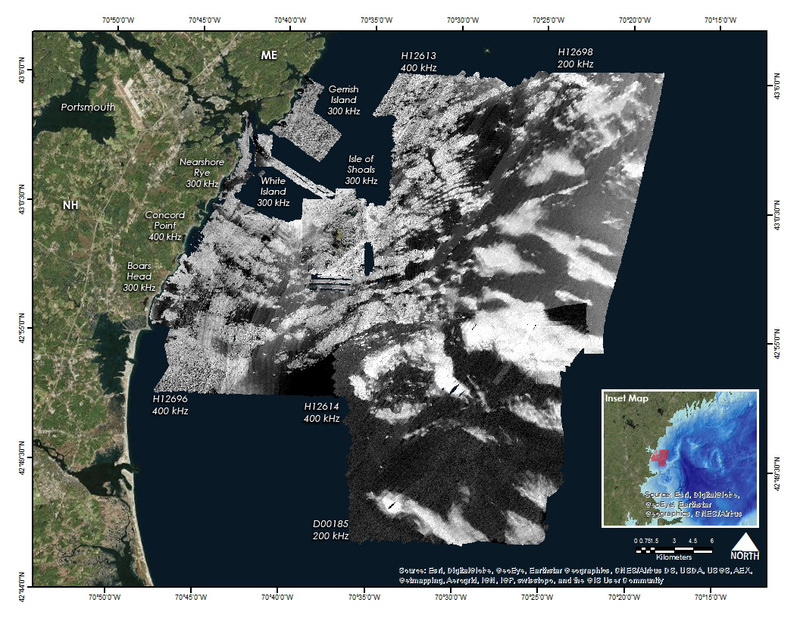 Backscatter synthesis gridded at 1.5 m for selected region in the Western Gulf of Maine. Individual surveys used in the synthesis are shown on the map. The information provided here is freely available for use. However, the University of New Hampshire (UNH) Joint Hydrographic Center/Center for Coastal and Ocean Mapping (JHC/CCOM) should be acknowledged for the composites of the bathymetry and backscatter. The agencies that conducted the original surveys (given in the metadata) should be acknowledged for individual surveys. 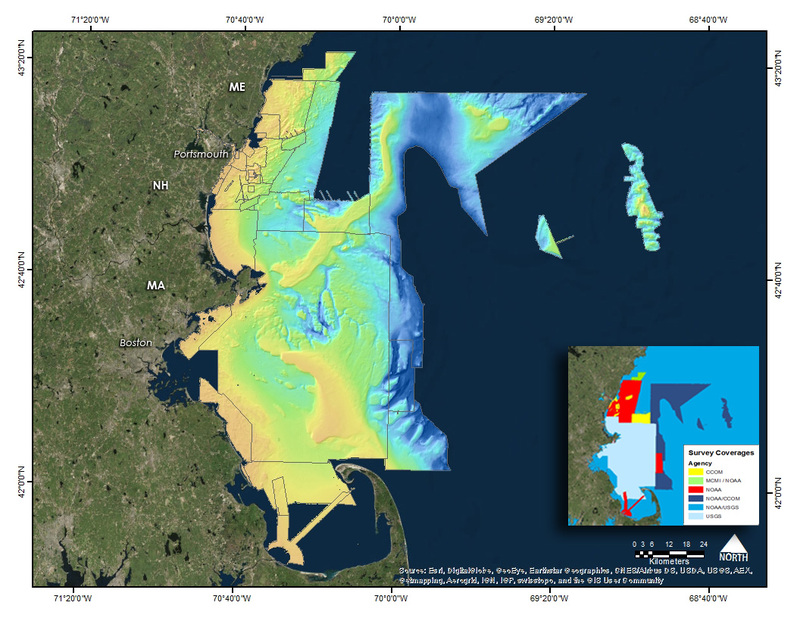 Development of the bathymetry and backscatter syntheses were supported primarily by UNH/NOAA Joint Hydrographic Center Award NA10NOS4000073. Partial support was provided by the Bureau of Ocean and Energy Management (BOEM) Marine Minerals Program Award M14AC00010. Larry Ward, Zachary McAvoy, and Maxlimer Vallee-Anziani aided with the analysis and development of the syntheses.